Day Two of the 2009 Los Angeles Film Festival, which was on Saturday June 20, was the first day I was able to attend. The festival was gracious enough to grant me a press pass this year. Unfortunately, I missed the opening night, but was able to catch a couple cool films Saturday evening. That picture to the left is the poster outside Westwood’s Regent Theater for one of those films, Tariq Tapa’s feature film debut Zero Bridge, the beautifully sad tale about a Kashmiri teenage pickpocket. I’ll have full reviews up for Zero Bridge and all of the LAFF films I see in the coming days, although thanks to a new gig the number of films I see probably won’t be as many as I had previously hoped. 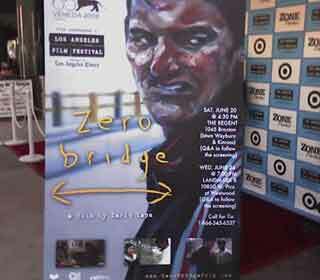 The Zero Bridge screening was a good one. Nice crowd and a very informative Q&A session with the soft-spoken, NYC-born Tapa. The film is a real one-man-band production, with Tapa directing, shooting, editing and even doing the audio for the entire project himself, which was shot entirely on location in Kashmir. Handling all that alone for a first feature, Zero Bridge is a remarkable achievement and accomplishment. Zero Bridge, which exists in the realm of films I enjoy personally, is a bit above the underground niche I typically cover on the Underground Film Journal. But the second film I caught on Saturday was even a couple of notches above that. I had a few choices to pick from and I completely sold out and went the celebrity route: Seeing the Patton Oswalt-starring Big Fan. The film is the directing debut of Robert Siegel, screenwriter of the Oscar-nominated The Wrestler. Although, Siegel wasn’t in attendance, Oswalt hosted a hilarious Q&A session after the film. But you couldn’t have expected less since he’s a great professional stand-up comedian. Yet, his Q&A didn’t sound like a canned performance as a couple of questions genuinely seemed to flummox him, particularly one in which he confused a question about his on-screen wardrobe with his wardrobe at the screening. The dude’s hilarious and comfortable enough with an indie film crowd to drop a casual Robert Bresson reference. Big Fan is a good companion piece to The Wrestler. Compared to Siegel’s previous film, as it’s inevitably going to be, it presents the flipside to professional sports even though Oswalt’s eponymous main character is obsessed with a football player and not a pro wrestler. But beyond the world of sports, the film is relatable to the wider world of pop culture obsession. I’m headed back to the LAFF tonight to catch another film or two. Not sure how fast I can turn around another report or my full reviews, but I hope to have ’em as soon as I can. As for underground stuff happening at LAFF, Andy Warhol‘s Screen Test film had only one screening on Saturday that I couldn’t attend since it was on the other side of town. It was either that or see two modern films, so I went the modern route. But, next Saturday June 27, LAFF is screening a restored version of Curtis Harrington’s 1961 film Night Tide, starring Dennis Hopper, which I may be mistaken but believe was Harrington’s first feature after directing several of his own underground short films and doing the cinematography for Kenneth Anger‘s Puce Moment and Inauguration of the Pleasure Dome. For the Los Angeles Film Festival’s full lineup, go check out their official site. I had a great first night there and I’m looking forward to heading back.